Note 1 - For methods of estimating the atmospheric corrosion resistance of low-alloy steels, see Guide G 101. 1.2 When the steel is to be welded, a welding procedure suitable for the grade of steel and intended use or service is to be utilized. 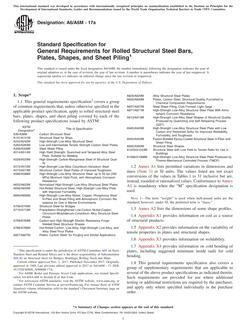 See Appendix X3 of Specification A 6/A 6M for information on weldability. 1.5 For structural products produced from coil and furnished without heat treatment or with stress relieving only, the additional requirements, including additional testing requirements and the reporting of additional test results, of Specification A 6/A 6M apply.